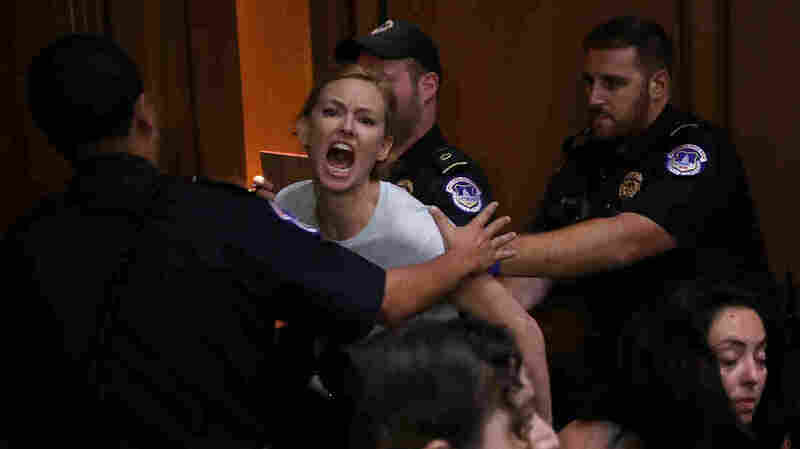 The Resistance At The Kavanaugh Hearings: More Than 200 Arrests Opponents of Kavanaugh's nomination don't have the votes to derail his confirmation, but protesters voiced their concerns at his hearing about a conservative majority's impact on the Supreme Court. "This is a mockery and a travesty of justice," yelled one protester this week. "Kavanaugh can't be trusted," shouted another. Some protesters wore shirts that read things like "I am what's at stake." Others arrived on Capitol Hill dressed as characters from The Handmaid's Tale, the story of a dystopian future in which women are treated as property of the state. At least 227 demonstrators were arrested between the start of the nomination hearings on Tuesday and the end of testimony on Friday, according to the U.S. Capitol Police. Most of those charged this week with disorderly conduct, crowding or obstructing paid fines of $35 or $50. Such shows of protest are nothing new on Capitol Hill. Televised hearings are open to the public, and as such, the outbursts that roiled much of the judge's testimony have become a regular feature of similar high-profile hearings. But the degree of opposition on display in the hearing room underscored the level of anger among progressive activists over a pick that would cement the Supreme Court's conservative majority for years, if not decades, to come. "Disrupting the hearings was a way for us to go directly into the homes of the American people to say, 'We will not be silenced and you need to be as outraged as we are,' " said Linda Sarsour, a co-chair of the Women's March and one of the organizers of this week's protests. Leaders from the Women's March were among a broad coalition of organizations, including abortion rights groups, labor unions and advocates for gun control, behind this week's activism. The Women's March partnered with the Center for Popular Democracy to help coordinate interruptions during the hearing and will assist demonstrators who are fined or arrested with legal and financial support, said Sarsour. Sarsour said she was the first person to shout out on Day 1 of the hearing. She was one of 70 people arrested that day. That included actress Piper Perabo, known for her role on the show Covert Affairs on the USA Network. Planned Parenthood and its political arm, Planned Parenthood Action Fund, also organized members from across the country, Dana Singiser, vice president for public policy and government affairs at Planned Parenthood, told CNN. Their efforts included sitting in the hearing room, participating in a nightly vigil on Capitol Hill, writing letters to senators, and setting up meetings between lawmakers and constituents. The disruptions throughout the hearing rankled senators on the Judiciary Committee. Ben Sasse, R-Neb., described the protests as "hysteria," and Orrin Hatch, R-Utah, said, "These people are so out of line they shouldn't even be allowed in the doggone room." Many of the outbursts came with several of Kavanaugh's closest friends and family in attendance, including his parents, wife, children and even former players for the youth basketball team he coached. In an interview with The Daily Caller on Tuesday, President Trump said, "I don't know why they don't take care of a situation like that because it's terrible ... I think it's embarrassing for the country to allow protesters, you don't even know which side the protesters were on." Despite such criticism, Sarsour said, "the women who have been arrested over the last few days" helped generate "political will for Senate Democrats to show some moral courage." She cited the move by New Jersey Democrat Cory Booker on Thursday to release a memo on racial profiling drafted by Kavanaugh but labeled "Committee Confidential," meaning senators could review it but not make it public. "We believe the movement helped encourage that," she said. But an aide to committee Chairman Chuck Grassley, R-Iowa, noted that Booker's staff and other aides to Democrats who requested some of those documents be made public were informed before Thursday's session that the public release had been approved. At least some Democrats expressed frustration with the outbursts in this week's hearings. "I think that the average independent voter — the labor family that voted for Trump last time but is now reconsidering — people like that don't think that screaming in a hearing room is a particularly effective strategy or a signal of a party that they much want to belong to," said Sen. Sheldon Whitehouse, D-R.I., in an interview with NPR's Audie Cornish on Wednesday. "So I think it's been not helpful to any cause that I can see." With Republicans holding a slim 51 to 49 majority in the Senate, it appears unlikely that efforts to defeat the Kavanaugh nomination will succeed. Grassley said Tuesday that he planned a committee vote on the nomination in mid-September. The full Senate confirmation vote is expected to come at the end of the month, with the aim of having Kavanaugh seated when the Supreme Court opens its next term at the beginning of October.